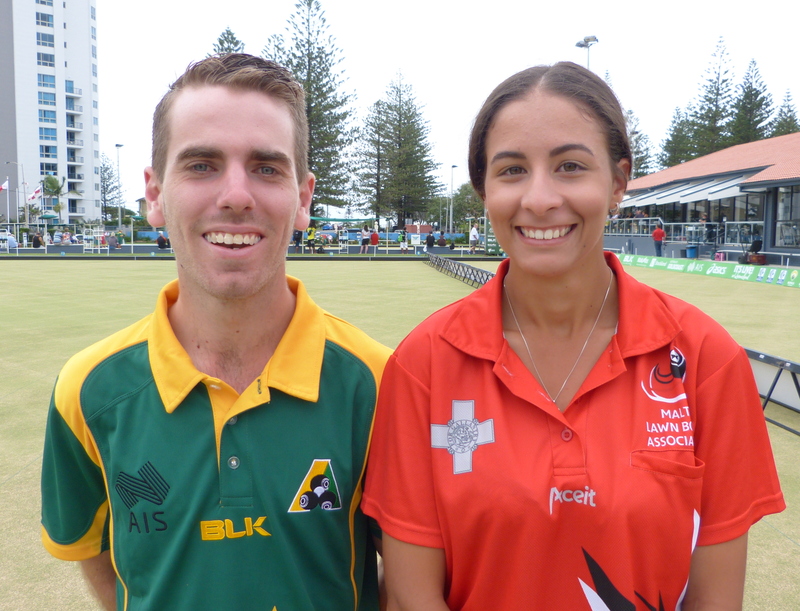 The composite team of Connie Rixon from Malta and Australia’s Bill Johnson emerged victorious in the World Youth mixed pairs championship final at Broadbeach Bowls Club on Australia’s Gold Coast today. They defeated the gallant Scottish duo of Claire Walker and John Fleming 21-17 in the 18-end gold medal match. Last night Rixon and Johnson rocked the establishment when they ousted defending champions and hot favourites Ellen Ryan and Aaron Teys 22-19 in a semi final clash, while further up the green Walker and Fleming did a similar number on the crack Aussie pairing of Kristina Krstic and Nathan Pedersen 16-14 to set up the historic play-off. Photo: New world youth mixed pairs champions Billy Johnson from Australia and Malta’s Connie Rixon.